Template:Lower Prior to 1999, the national currency was the Luxembourgian franc (fr.). 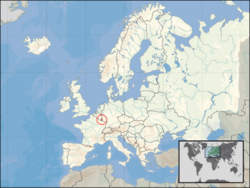 The Grand Duchy of Luxembourg (Luxembourgish: Groussherzogtum Lëtzebuerg, French: Grand-Duché de Luxembourg, German: Großherzogtum Luxemburg), historically spelled Luxemburg, is a small landlocked country in western Europe, bordered by Belgium, France, and Germany. Luxembourg has a population of under half a million people in an area of approximately 2,585 square kilometres (998 sq mi). Its capital city is Luxembourg. This page was last modified on 28 July 2014, at 21:55.